So, my camera hadn’t been cooperating very well lately. Rather, it wasn’t cooperating at all. But now that we have a new camera, I can catch up with some FOs that needed photographing. I lovelovelove these socks. First of all, the pattern is gorgeous – looks way more complicated than it really is. The slip-stitch pattern works really well with handpainted, hand-dyed, and variegated yarns. I also really love this yarn. My former LYS (when I lived in PA) carried lots of this yarn for a while. It was all so beautiful, so I ended up buying several hanks in multiple colors (and even bought the same colorway twice, unintentionally). The yarn is especially beautiful with this pattern. 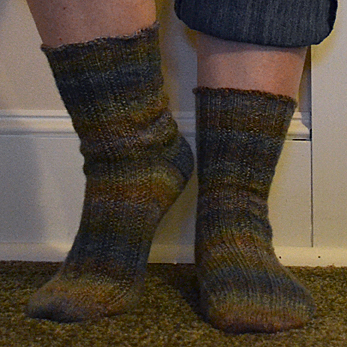 This was the second time I knit socks using this pattern. 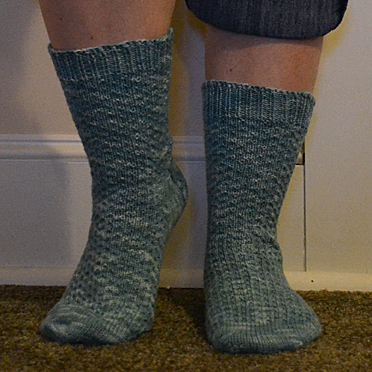 However, this time I switched to knitting them toe-up instead of cuff-down (I followed Wendy D. Johnson’s Toe-Up Socks with Slip-Stitch Heel pattern for the sole and heel). And, since I knit them 2-at-a-time on magic loop, I used my Addi circs, which are exactly .25mm larger than the size U.S. 1 DPNs I used the first time. Which means these came out huuuuuge. Plus, the yarn is part silk. Makes it feel really, really nice… but the socks stretch out and don’t snap back as well after washing as wool socks with no silk in them. But they’re great for winter when I need to wear two pairs of socks to shovel snow. I still love them, though. 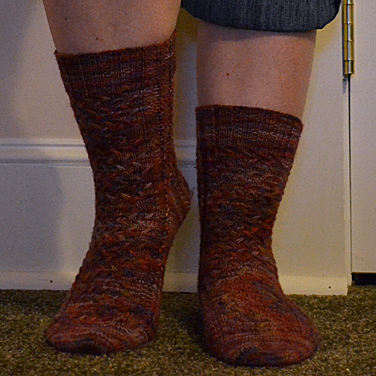 Pattern: Toe-up Socks with Slip-Stitch Heel by Wendy D. Johnson; added my own seeded rib pattern made up on the fly. After finishing up the second pair of Hermione socks, I needed a new pair on the needles for a travel project. I wasn’t sure which socks I wanted to knit next from my Ravelry queue, so I just started something plain and winged it. Ended up with a very nice seeded rib. This pattern would be great for men’s socks – actually, this yarn would be great for men’s socks as well. Like other Trekking yarns, it’s a good workhorse yarn with some nylon content for sturdiness. Very comfortable, and the seeded ribbing is very stretchy. I’m knitting on several other things right now, but nothing I can share yet since they’re gifts.